This symbolic birthday flower kit grows and changes every day, just like the lucky person who plants it. Birth month flowers, like stars and gemstones, have symbolic and sentimental meanings. Collaborate with Mother Nature to give this birthday gift that grows and changes every day. Seeds, a glass bottle to grow them in, soil-less growing medium, instructions, and info about what your flower symbolizes are all included. 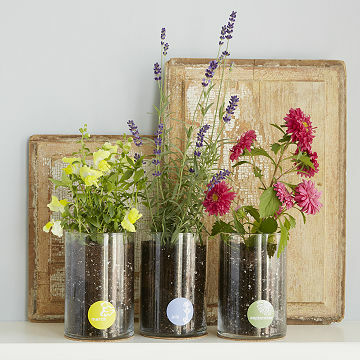 Once the garden has finished blooming, wash the grow bottle and use as a vase. Cork lid doubles as a coaster for the bottle. A lovely gift for gardeners, sentimental types, and those who don't want any "stuff." Made in Idaho. 5.5" H x 4" Dia. I bought this for my mom's birthday and she called me when it arrived at her house and told me how much she liked it. It was the perfect simple but unique gift. The flowers have never sprouted. I put water in the bag as stated in directions. I put the soil water mixture in the jar and added seeds. I covered with plastic and waited. After 24 days, I have been looking for replacement seeds so my child (who gave it to me) won't be disappointed. But I haven't found any. I bought this as a gift for my daughter. There is nothing about it that makes it worth the cost. I got the Red Zinnia (December) for my friend for her birthday. We have been friends for 20 years, so I'm always trying to find not-ordinary gifts. She was so happy to receive it! And the very best part was this: she has it on her kitchen window ledge, and as it began to sprout and grow, she sent pics to me. Let me tell you, seeing beautiful green plants growing in late December and early January was just the thing our souls needed during that long, cold, snowy winter we are just coming out of. So the gift I got her ended up gifting me as well!! The seeds never germinated. The recipient is an experienced gardener, so I don't think the fault was hers. Ordering was easy and it arrived on time. The flowers arrived on time and I was told they were beautiful. I purchased this as a gift for my wife. I was so excited to give it to her after reading all of the reviews. She followed the directions to a tee. The seeds germinated and started to sprout, and then subsequently shriveled up and all died. We were very disappointed! !